First, congratulations to you and your family for finally feeling ready to adopt a new house-hold member! We know, and understand, that no such decision should be taken lightly without full consideration of all possibilities and options. 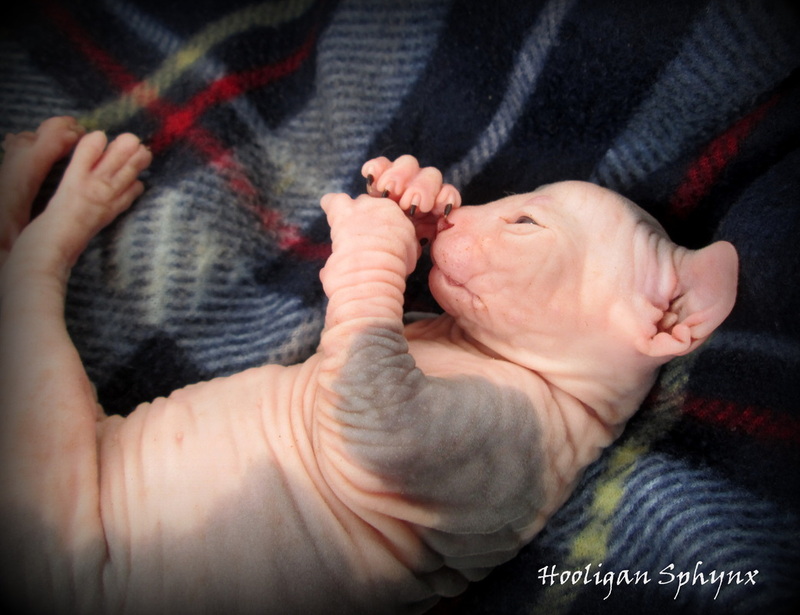 While one of our kitten's may become your new baby they are 1st our babies and so it's very important to us that their new family be mentally, physically, and financially ready to properly take care and love their new little, wrinkled, hairless (possibly short) addition! If you find a kitten on our website that you are interested in let us know. We are pretty good about up-dating the status on our kitten's but we are busy and don't always get to it. We generally go by the rule, "Available until Deposit Received" however we are usually pretty flexible with this as long as their is good communication. We will guarantee the hold of your baby until they are ready at 14-16 weeks once the $400.00 deposit is received. Without the deposit we will do our best to hold your kitten of interest for you but we cannot guarantee it's availability. Deposit's can be mailed or sent via paypal. With all paypal payments we ask that the new family kindly add 3% for paypal fee's. Once your kitten is reserved we will mail out 2 copies of our sales contract (which protects us and you). We must receive the contract within 2 weeks of our sent date (will be written on the contract) or else we will cancel the sale of your kitten and your deposit will be lost-we take our contract very seriously! We will notify you when we mail the contracts so you know when to look for it. 1 copy of the contract will be signed by us (you keep for your records) the 2nd copy you will INT where it says to, sign, and mail it back-this is for our records. Please note that all of our kittens leave on a strict spay/neuter contract so if your intent is to breed and not pay for the breeding/show rights please search for your kitten elsewhere. We have worked very hard on the quality of our kitten's and to breed them you buy the right from the breeder which gives common courtesy and credit. If your kitten is being delivered via air cargo we will ask for the balance 2 weeks before your kitten will be ready (Generally at 12 weeks of age). This gives us relaxed time in collecting the crate/supplies and making their vet appointment for their health certificate. We do not accept checks for the remaining balance. If, your kitten is being picked up in person the balance can be paid in cash when you pick up your baby. We are also willing to drive and meet you free of charge if 1 hour round trip or if you would like us to travel further we can do so with gas/time compensation. We love our cat's and we grow to love the families that make them apart of their lives. As a breeder and enthusiast of the sphynx and Bambino breed we will always be here for you. We greatly enjoy up-dates as your kitten grows and especially love picture's of your baby in their new home. Nothing makes us happier than seeing our babies grown up in a loving, fantastic home living the life they deserve! If we didn't cover one of your questions please let us know!